Major-General Robert, Chief Military Observer and Head of Mission of UNSMIS. United Nations observers in Syria have been obstructed in their attempts to reach the village of Mazraat al-Qubeir today, to verify reports of large-scale killings there. “Their mission is being obstructed by three factors: First, they are being stopped at Syrian Army checkpoints and in some cases turned back; second, some of our patrols are being stopped by civilians in the area; thirdly, we are receiving information from residents of the area that the safety of our observers is at risk if we enter the village,” the head of the United Nations Supervision Mission in Syria (UNSMIS), Major-General Robert Mood, said in a statement. “Despite these challenges, the observers are still working to get into the village to try to establish the facts on the ground,” he added. According to media reports, Syrian activists claim that Government troops and militiamen massacred at least 78 villagers in Mazraat al-Qubeir, located near the city of Hama. UNSMIS dispatched observers to the site early Thursday – while trying to reach the village, they were also shot at with small arms. The UN estimates that some 10,000 people, mostly civilians, have been killed in Syria and tens of thousands displaced since the uprising against President Bashar al-Assad began some 15 months ago. The Security Council established UNSMIS in April to monitor the cessation of violence in Syria, as well as monitor and support the full implementation of a peace plan put forward by the Joint Special Envoy of the United Nations and the Arab League for the Syrian Crisis, Kofi Annan. Later today, Mr. Annan will brief the General Assembly in person, followed by the Security Council and the media, on the latest developments in Syria. Also speaking in the Assembly meeting will be President of the General Assembly, Nassir Abdulaziz Al-Nasser, Secretary-General Ban Ki-moon and the Secretary-General of the Arab League, Nabil Al Araby. 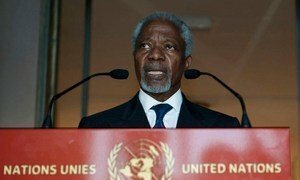 The Joint Special Envoy of the United Nations and the League of Arab States, Kofi Annan, today warned of the growing sectarian violence in Syria, adding that the conflict is already having serious consequences in the region and calling on the international community to work together to push for the implementation of the six-point peace plan.